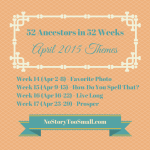 Posted in 52 Ancestors Challenge on December 4, 2015 by Amy Johnson Crow. 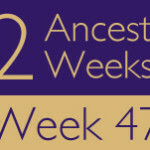 Only 4 more weeks in the 52 Ancestors in 52 Weeks Challenge! The optional theme for Week 48 was “Thankful.” Please leave a comment with a link to your Week 48 post (whether or not you used the theme). Week 49 (December 3-9) – Holidays. What ancestor do the holidays put you in mind of? Week 52 (December 24-31) – Resolution. A resolution can be something that you resolve to do. It can also be the end or conclusion of something. What ancestor do you resolve to find more about in 2016? What ancestor have you resolved conflicting evidence about? I wrote about how much better this Thanksgiving was for my family than the previous one and why I am so thankful. I found a neat family register book dated 1718-1940 and notebooks with lists of all baptisms, marriages, and deaths for 1790-1804 in Mamer, the hometown of my 3rd great-grandparents Jean FRANTZ and Elise FRISCH. I chose my 5th great grand-aunt whose given name was “Thankful”. I’m kicking myself that I wasn’t smart enough to think of my ancestor(s) named Thankful. But thank you, Joanne Barnard for reminding me of those ladies! I wrote about my 9th Great Grandfather, William Bassett, who arrived on The Fortune one year after the Mayflower. Cochrane–I have some Thanksgiving postcards so I blogged about them. 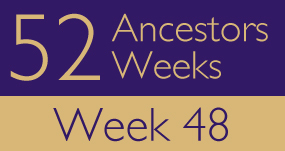 For me, this was ancestor #100 – I can’t believe I’ve actually managed to do this every week for 100 weeks. Thanks for the challenge Amy! I wrote about my two (known) Mayflower ancestors, one of whom almost didn’t make it and his many ancestors are thankful he did: John HOWLAND. A couple of days later I wrote about my other Mayflower ancestor: Mary CHILTON and her father James CHILTON. I wrote about the colorful life of my husbands second great aunt who had a fire in her house on Thanksgiving day. She was probably thankful it was put out quickly in spite of the questionable circumstances.